The Finish Line is Within Sight! So me and The Kid have been putting some real effort into finishing this dollhouse and we’re getting very close. I am hoping to have the bulk of it done by the end of the weekend. I am so ready for this project to be done and over with… and I can get my entry way back! So, updates: The floors have been done in the bathroom and the bedroom. 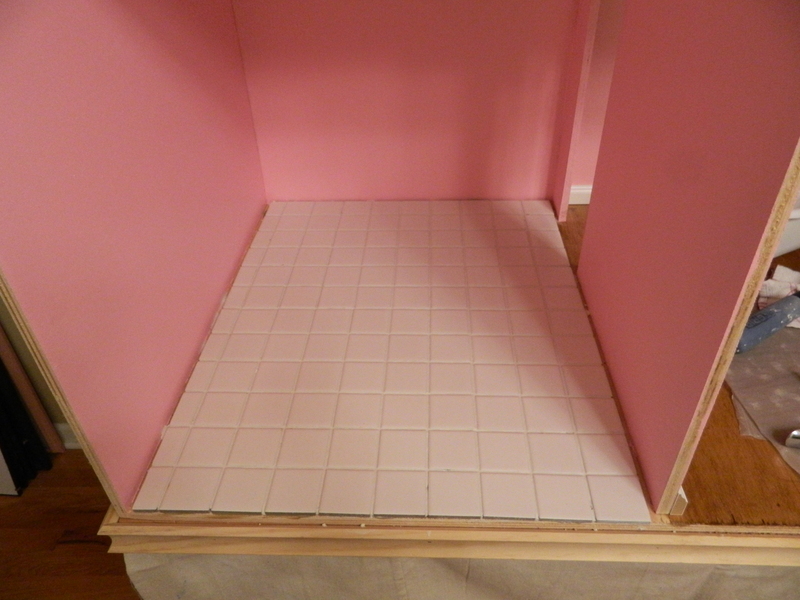 Laid 2″ square tiles in the bathroom and then grouted with caulk. Because the house still needs to be delivered and therefore undergo some critical traveling, I didn’t want the grout to break or crack so thought that the caulk would be a much better solution. Here is a quick shot of the tile installed. I used Liquid Nails to adhere it, not standard practice for the installation of tile but a good solid decision based on the size of the room and the number of tiles. 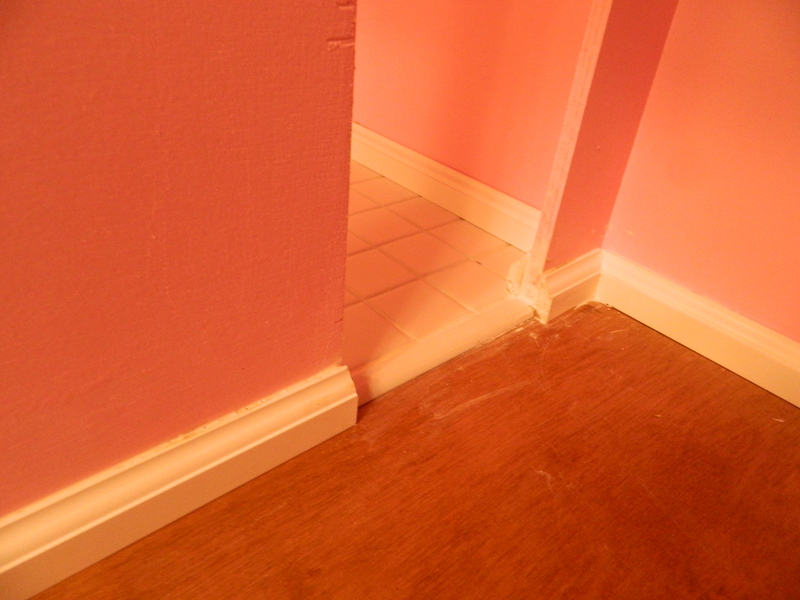 Here is the floor with the caulk ‘grout’. I am really liking the clean look of the tile. Here it is with the baseboard trimming. Isn’t this sweet? And The Kid did a great job of making a door transition and gluing and then grouting the space between the bathroom and the bedroom. A little bit of clean up to do and it is ready to be staged. You can see in this photo that the floor has been stained (two coats) and then polyurethaned (two coats) and the trim also installed. 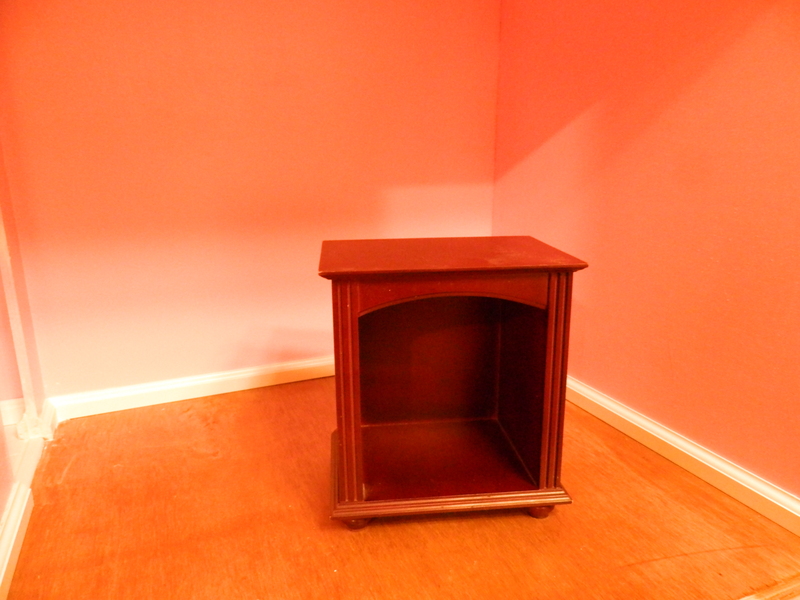 It, too, is ready for furniture! 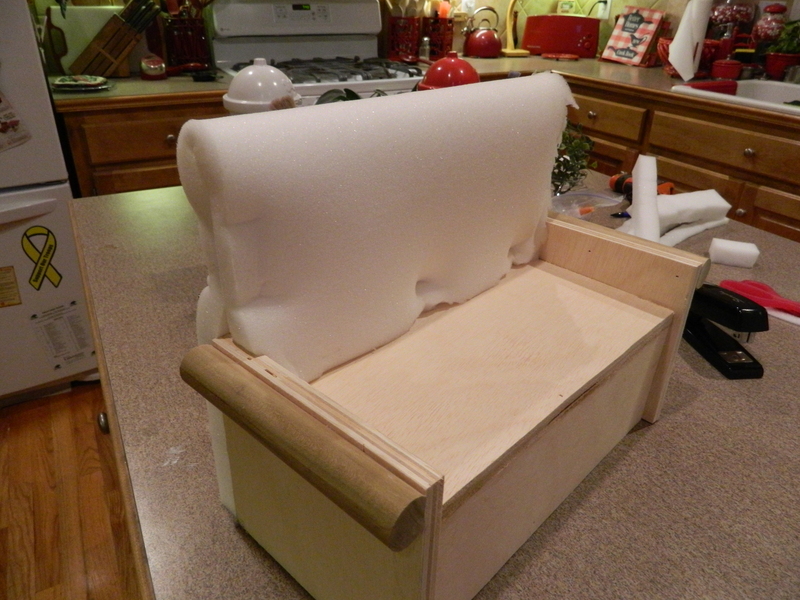 You may recall that I started work on the love seats, I wanted to show you how I applied 1″ foam to the pieces to get ready for upholstery. One piece wraps up from the seat and over, all the way to the bottom. 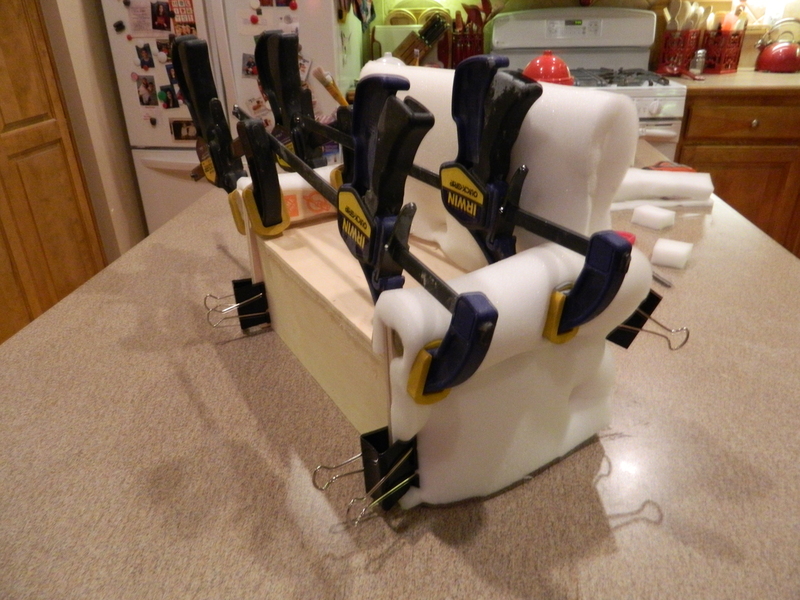 A couple of staples and lots of glue, a few clips to hold it in place while it dries. 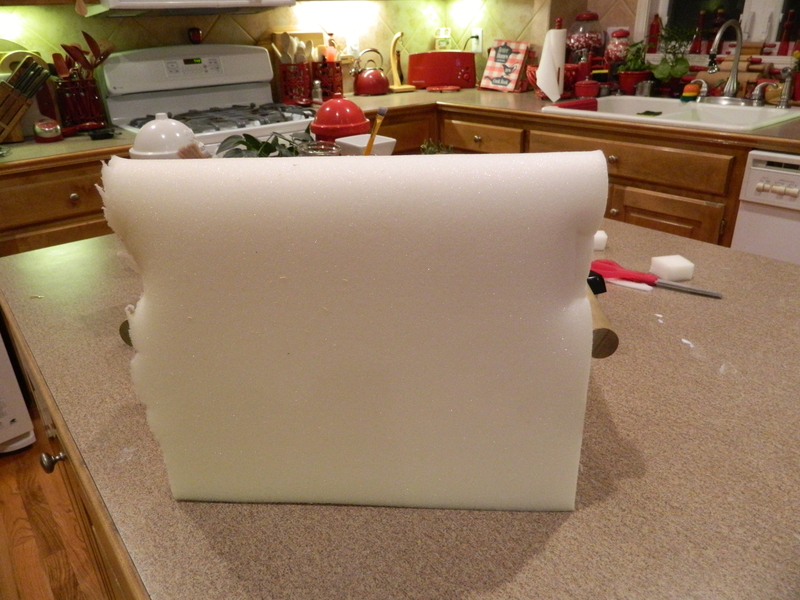 Next, I wrapped both arms with the same foam. 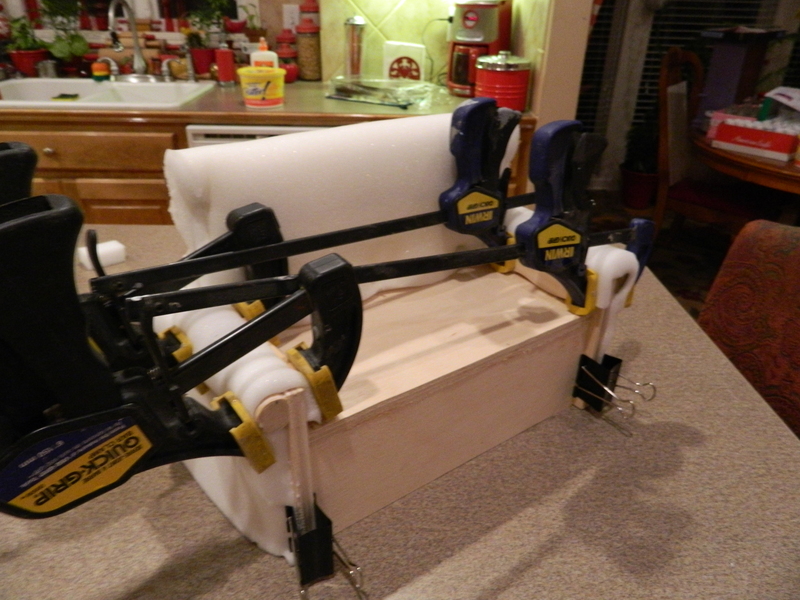 This time I used clamps in addition to the staples, clips and glue to hold things together until they dried. 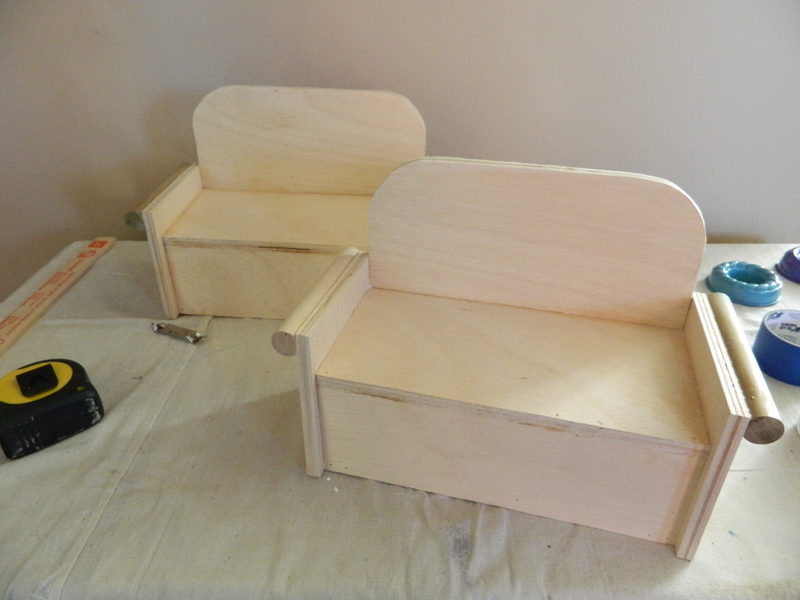 Both loveseats got similar treatments with the foam on the front (forgot the photos). But they have been relocated to my sewing room for the upholstery work. Probably won’t get to them until we finish the work on the house and its ready to be furnished. Additional photos promised. This is the side and back view of the third floor. Slowly this piece is coming along. You can see that I am toying with ideas for how to “roof” the angled pieces, and at this point, have not settled on a solution. I stumbled across the most wonderful little piece of furniture. 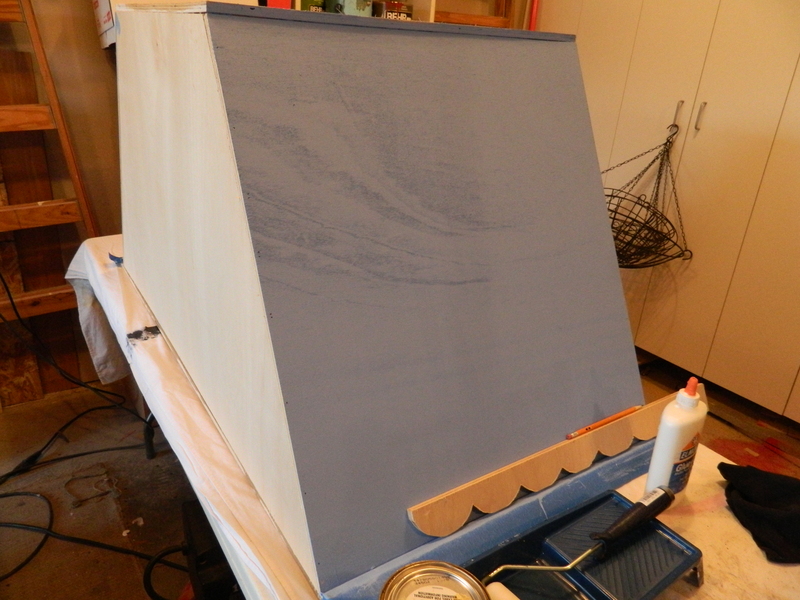 It actually had three small photo albums in it, but it is going to be transformed into a fireplace. Which means, at some point, I need to scout “fire wood” for it. I also need to figure out how to put floor moulding with the tricky angles, but The Kid thinks he has a way. Ah, I love that Kid! I won some glassware at a local auction, in additional to a 12 foot x 30″ purple counter top (all for the grand sum of $15!) that I have plans for. 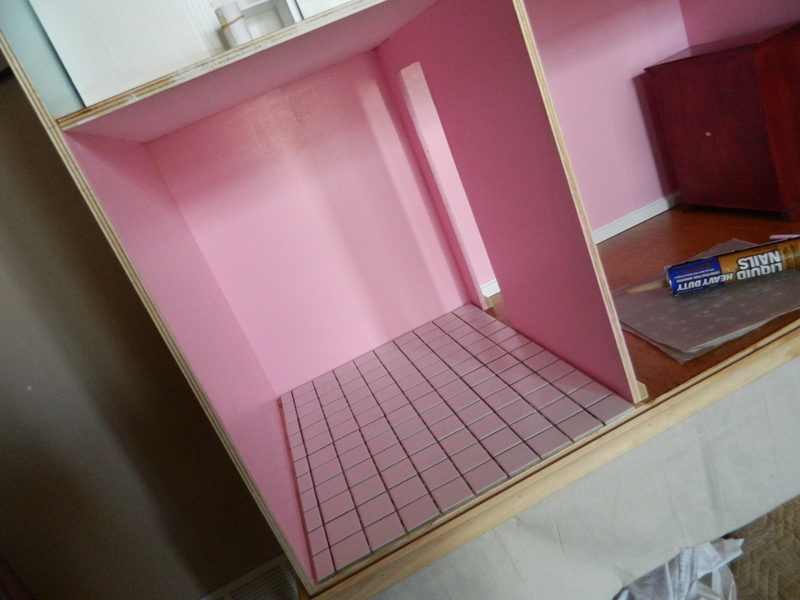 But… like I have said many times, no new projects started until this doll house is completed. Now that I have this quick update written, I am going to go work on the kitchen’s lower cabinets and get them ready for installation. Once that happens, then I can do the tile countertops, get the sink installed and complete the trim around the edges. Then its just a matter of details! I can see the finish line! Once this has been done, it is going up for sale. 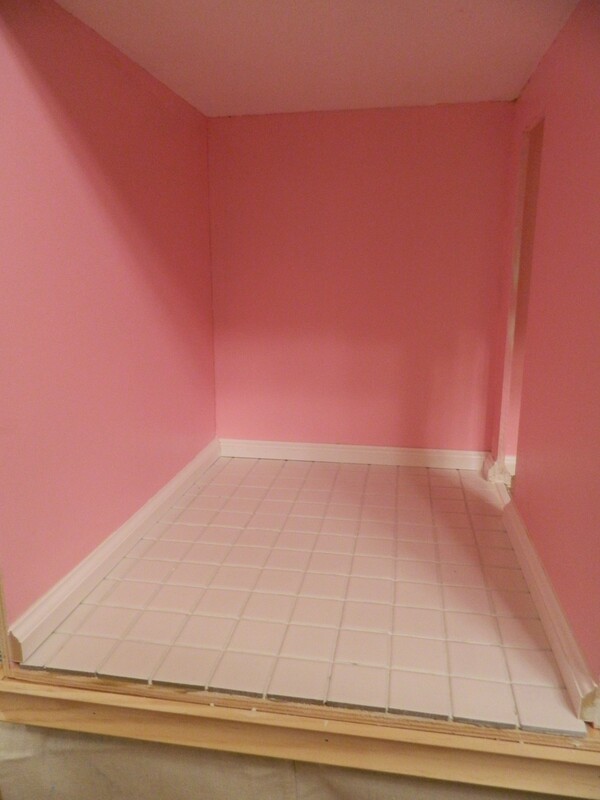 If you are in the market for a custom doll house, watch this space. I have been thinking about the logistics of getting this shipped or (my choice) delivered, I know that whoever is the recipient of this gift is just going to love it. And just in time for Christmas! Okay, thanks for stopping by and for following my progress. Remember to keep making beautiful things for the sake of beautiful things! And of course, I’d love to hear any ideas you might have for finishing touches!